Home / News / Kaleerein actress Aditi Sharma goes Katrina Kaif way! Kaleerein actress Aditi Sharma goes Katrina Kaif way! Mumbai: The newbie actress took inspiration from Katrina Kaif’s character in the movie ‘Mere Brother Ki Dulhan’ for the reel wedding in Zee TV’s show Kaleerein. Much like Katrina’s character of Dimple in the movie ‘Mere Brother Ki Dulhan’, Meera is a happy go lucky and a modern millennial Indian woman who doesn’t wish to conform to the stencil of the perfect Indian bride, refusing to put up an act that will impress the ideal suitors. Outgoing and loud in nature, Meera believes in maintaining her identity and not give in to societal pressure. And while currently in the show, viewers are witnessing some high-octane drama thanks to Meera’s looming wedding festivities with Sumer (Paramvir Singh Cheema), Meera’s much-awaited wedding day will see a beautifully dressed Punjabi bride resembling to that of Katrina’s wedding day attire in the movie and riding a sports bike wearing Kaleerein. “My character in the show is of an extrovert and doesn’t give into any societal pressure. 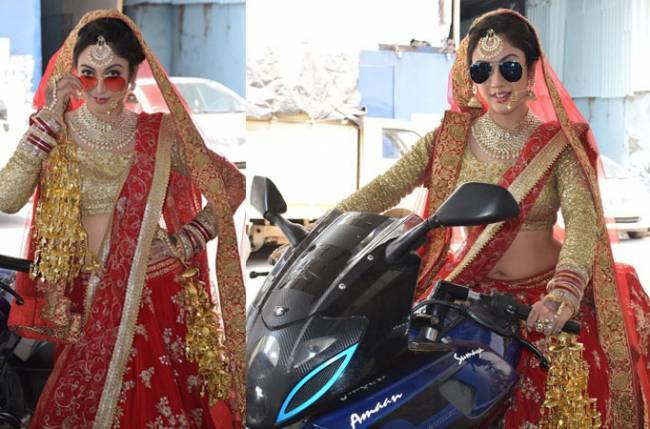 It’s the first time that I will be donning a bridal avatar in my life and I am thrilled to have experienced and enact a scene of riding a sports bike wearing the wedding lehenga and Kaleerein in my hands just like Katrina Kaif. I am a huge fan of Katrina Kaif and I look upto her in real life. I have had a lot of fun while shooting for it and I hope the audience enjoy the wedding drama.” said Aditi Sharma.